Modern hermeneutics has familiarized us with Hans-Georg Gadamer’s principle of the “history of effects” (Wirkungsgeschichte). According to this method, to understand a text we need to take into account the effects it produced in history, placing oneself within that history and dialoguing with it. This principle is highly useful when applied to the interpretation of Scripture. It tells us that we cannot fully understand the Old Testament except in the light of its fulfillment in the New, and we cannot fully understand the New Testament except by the fruit that it has produced in the life of the Church. Historical-philological study of “sources,” the influences a text has undergone, is therefore not enough by itself. We also need to take into account the influences the text itself has exercised. It is a principle that Jesus had much earlier formulated, saying that every tree will be known by its fruit (see Lk 6:44). The fulfillment or fruits of this document have been of two kinds. 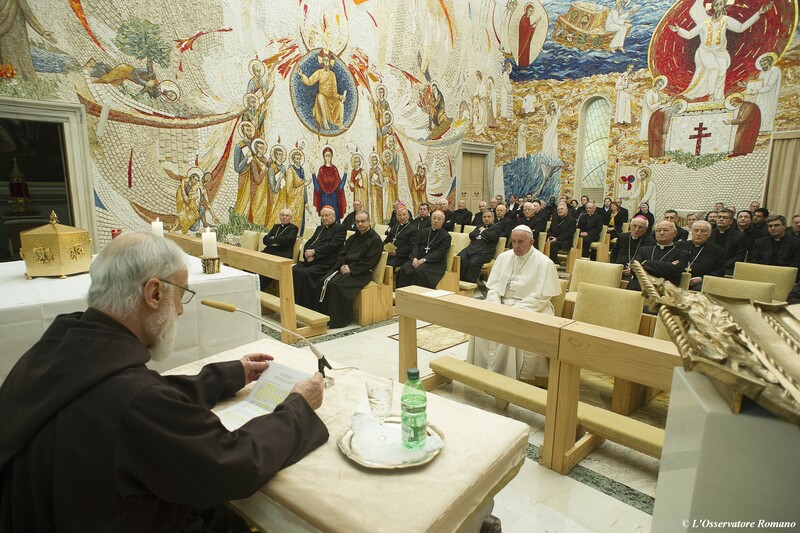 On the doctrinal and institutional level, the Pontifical Council for Promoting Christian Unity has been established. In addition bilateral dialogues with almost all the Christian confessions have been initiated with the goal of promoting a better reciprocal understanding in comparing our positions and overcoming prejudices. Alongside this official and doctrinal ecumenism, an ecumenism of personal encounters and reconciliation of hearts has arisen since the very beginning. In this regard some famous meetings stand out that have marked the ecumenical journey during these fifty years: the meeting of Paul VI with the Patriarch Athenagoras, the innumerable meetings of John Paul II and of Benedict XVI with various leaders of Christian churches, the meeting of Pope Francis with the Patriarch Bartholomew in 2014, and finally, a few weeks ago, the meeting in Cuba with Kirill, the Patriarch of Moscow, that opened up a new horizon for the ecumenism. This spiritual ecumenism also includes many initiatives in which believers from different churches meet to pray and proclaim the gospel together—without any intention of proselytizing and with people remaining completely faithful to their churches. I have been blessed to participate in many of these meetings. One of them has remained particularly vivid in my mind because it was like a visual prophecy of what the ecumenical movement should be leading us to. In 2009 there was a large demonstration of faith in Stockholm called the “Jesus Manifestation.” On the last day, believers from various churches, each coming from a different street, processed toward the center of the city. Our small group of Catholics led by their local bishop also processed down a street praying. Once at the center, the separate procession lines broke up and merged into one crowd that proclaimed the Lordship of Christ—a crowd of 18,000 young people and of astonished bystanders. What was intended to be a demonstration “for” Jesus became a powerful demonstration “of” Jesus. His presence was almost palpable in a country that is not accustomed to that kind of religious demonstration. These developments from the document on ecumenism are also a fruit of the Holy Spirit and a sign of the new Pentecost that was prayed for. How did the Risen One convince the apostles to be open to Gentiles and to welcome them into the Christian community? He led Peter to the home of the centurion Cornelius and made him witness the coming of the Spirit on those in attendance with the same manifestations that the apostles had experienced at Pentecost: they spoke in tongues and glorified God with loud voices. Peter could only draw the conclusion, “If then God gave the same gift to them as he gave to us, . . . who was I that I could withstand God?” (Act 11:17). The risen Lord is still doing the same thing today. He sends his Spirit and his charisms, often with the identical external manifestations, on believers of quite different churches, including those whose beliefs we had thought were the furthest from ours. How can we not see in that a sign that he is urging us to welcome and acknowledge them as brothers and sisters even if we are still on the journey to more complete unity on the visible level? In any case this is what converted me to a love for Christian unity, although I had been accustomed by my studies in the period before the Council to regard the Orthodox and Protestants only as “adversaries” to refute with our theological arguments. During Lent last year, I tried to show the results of the ecumenical dialogue with the Orthodox East on the theological level. I collected those meditations in a short book called “Two Lungs, One Breath,” and the title itself indicates what we are striving for and in large part has already come to pass. At this time I would like to turn our attention to the relationship with the other great partner in the ecumenical dialogue, the Protestant world, not to enter into historical and doctrinal questions but to show how everything is impelling us to move forward in the effort to restore the unity of Western Christianity. One circumstance makes this effort particularly relevant. The Christian world is preparing to celebrate the fifth centenary of the Reformation in 2017. It is vital for the whole future of the Church for us not to miss this opportunity by remaining prisoners of the past or limiting ourselves, in more irenic tones, to determine the rights and wrongs of both parties. It is the moment, I believe, to make a qualitative leap forward, like a ship arriving at the lock of a river or a canal that allows for forward navigation at a higher level. The situation has changed profoundly in these last five hundred years, but as always it is hard to take due notice of it. The issues that provoked the separation between the Church of Rome and the Reformation in the sixteenth century primarily included indulgences and the way in which justification takes place for the unrighteous. But, can we say that these are the problems today by which the faith of people stands or falls? In a conference held at the Center for Unity in Rome, Cardinal Walter Kasper correctly observed that while the number one existential problem for Luther was how to overcome a sense of guilt and find a gracious God, today the problem is instead the contrary: how to restore to people today the true meaning of sin since they have entirely forgotten it. I believe that all the centuries-old discussion between Catholics and Protestants about faith and works has ended up making us lose the main point of the Pauline message. What the apostle wanted to affirm above all in Romans 3 is not that we are justified by faith but that we are justified by faith in Christ: it is not so much that we are justified by grace as it is that we are justified by the grace of Christ. Christ is at the heart of the message even more so than grace and faith. After having presented humanity in its universal state of sin and damnation in the two preceding chapters of Romans, the apostle has the unmitigated courage to proclaim that this situation has now radically changed “through the redemption which is in Christ,” “by one’s man’s obedience” (Rom 3:24, 5:19). The assertion that this salvation is received by faith and not by works is present in the text and was the most urgent thing to bring to light in Luther’s time, when it was obvious, at least in Europe, that the issue at hand was faith in Christ and the grace of Christ. But this truth holds second place, not first place. We made the mistake of reducing to a theological problem internal to Christianity what was for the apostle instead an affirmation of far-reaching and cosmic significance. We are being called today to rediscover and proclaim together the very heart of the Pauline message. In the description of medieval battles, there is always a point at which, after the archers, the cavalry, and all the rest of the army had been overcome, the fight was focused on the king. That was the point at which the final outcome of the battle was determined. For us as well the battle is around the king . . . the person of Jesus Christ is what is at stake. From the point of view of evangelization, we need to return to the time of the apostles. There is analogy between our time and theirs: they were facing a pre-Christian world, and now in the West we are facing a largely post-Christian world. When the apostle Paul wants to summarize the Christian message in one statement he does not say, “We proclaim this or that doctrine to you.” Instead he says, “We preach Christ crucified” (1 Cor 1:23), and “We preach . . . Jesus Christ as Lord” (2 Cor 4:5). This is now the true “articulus stantis et cadentis Ecclesiae,” the article by which the Church stands or falls. This does not mean ignoring all that the Protestant Reformation has produced that is innovative and valid—whether in the area of theology or of spirituality—especially with its reaffirmation of the primacy of the word of God. It means rather allowing the whole Church to benefit from its positive achievements once they are freed of certain excesses and hardening of positions that were due to the overheated climate of that time, and to political interference and subsequent polemics. I was present when this agreement was proclaimed in St. Peter’s Basilica during Solemn Vespers presided over by John Paul II and the archbishop of Uppsala, Bertil Werkström. One observation the pope made during his homily struck me. If I remember correctly, he expressed this thought: the time has come to stop making the doctrine of justification by faith a topic of fighting and dispute among theologians and seek instead to help all baptized people have a personal and liberating experience of this truth. From that day on, every time I have had the opportunity in my preaching, I have not stopped trying to help brothers and sisters have this experience. Modern societies are built upon science. They owe to it their wealth, their power, and the certitude that tomorrow far greater wealth and power still will be ours if we so wish. . . . [Nevertheless,] armed with all the powers, enjoying all the riches they owe to science, our societies are still trying to live by and to teach systems of values already blasted at the root by science itself. The “systems of values already blasted at the root” are of course religious systems. Jean-Paul Sartre, coming from a philosophical point of view, reached the same conclusion. He has one of his characters say, “It was . . . I who accused myself today, I alone who can absolve myself; I, man. If God exists, man is nothing.” It is to this kind of challenge that Christians today should respond with the doctrine that “A man is not justified by works of the law but through faith in Jesus Christ” (Gal 2:16). 3. Beyond the formulas I am convinced that the role played by formulas slows down and weighs on the ecumenical dialogue with the Protestant churches. Let me explain. Doctrinal and dogmatic formulations—which in the beginning were the fruit of vital processes and reflected the path undertaken and the truth that had painfully been reached—tend to become rigid with the passing of time and become “watchwords,” labels that indicate affiliation. Faith no longer terminates in the real thing, but in its formulation, just the opposite of what according to St. Thomas Aquinas the right path should be. The phenomenon of formalism already began in antiquity once the creative phase of the great dogmas ended. Only recently, for example, has it been understood that the divisions at the heart of the Christian East between Chalcedonian Churches and the so-called Monophysite or Nestorian Churches were based on formulas and on the different meanings given to the words ousia and hypostasis that do not affect the substance of the doctrine. Once this was understood, it has been possible to restore communion with and among various Eastern churches. This obstacle is particularly apparent in relation to the churches of the Reformation. Faith vs. works and Scripture vs. tradition were understandable oppositions, and in part justified at first, but they become misleading if they get repeated and maintained as though nothing had changed in 500 years. Let us take, for instance, the opposition between faith and works. It makes sense if by “good works” one primarily means (as it unfortunately did in Luther’s time) indulgences, pilgrimages, fasts, votive candles, and so on. The contrast becomes misleading, however, if by “good works” we mean works of charity and mercy. Jesus warned us in the gospel that without them we could not enter the kingdom of heaven and he would be forced to say to us, “Depart from me” (Matt 7:23). One is not justified by good works, but one is not saved without good works. All Catholics and Protestants believe that, and that is what the Council of Trent had said. The same has to be said about opposing Scripture and tradition. It surfaces as soon as the issue of revelation comes up, as if the Protestants had only Scripture while the Catholics had Scripture and tradition. In reality there is no church without its own tradition. What explains the existence of so many different denominations in Protestantism if not their diverse ways of interpreting Scripture? And what is Christian tradition, in its actual content, if not precisely Scripture as read in the Church and by the Church? Not even the Lutheran formula “Simul iustus et peccator,” “at the same time righteous and sinner,” is a real hurdle to communion. The definition of the Church as “the chaste harlot” (casta meretrix) and as “holy and always in need of being purified” (see Lumen gentium, 8) has been part of the Catholic tradition since the time of the Fathers. Should not what is said about the Church, the body of Christ as a whole, also apply in some way to each of its members? The way in which this coexistence of holiness and sin in redeemed human beings is understood can be open to various and complementary explanations. In the Appendix to the Joint Declaration on the Doctrine of Justification there is an explanation of the formula “simul iustus et peccator” which does not diverge from Catholic doctrine. It says that justification brings about a genuine renewal in the life of a baptized person—even if that righteousness never becomes an acquired possession on which a human being could base his or her relationship with God and is always dependent on the action of the Holy Spirit. In 1974 there was news that astonished and amused the whole world. A Japanese soldier, who was sent to an island in the Philippines during the last World War to infiltrate the enemy and gather information, had lived for thirty years hiding here and there in the jungle, eating roots, fruit, and occasional prey. He was convinced that the war was still going on and he was still on his mission. When they found him, it was hard to convince him that the war was over and that he could go home. I believe something similar has happened among Christians. There are Christians on both sides who need to be convinced that the war is over. The religious wars between Catholics and Protestants are over, and we have much better things to do than fight with one another! The world has forgotten, or have never known, its Savior, the one who is the light of the world, the way, the truth, and the life, so how can we waste time arguing among ourselves? 4. Unity in charity This practical reason is not enough, however, to bring about unity among Christians. It is not enough to find ourselves united in terms of evangelization and charitable activity. This is a path the ecumenical movement tried at the beginning, but it was soon shown to be insufficient. If the unity of the disciples should be a reflection of the unity between the Father and the Son, it should be above all a unity of love, because that is the unity that reigns in the Trinity. The three divine persons are united in their very being, not because they jointly operate whatever they do “ad extra”. Scripture exhorts us to “speak the truth in love [veritatem facientes in caritate]” (see Eph 4:15), and St. Augustine affirms that “one does not enter into truth except through love” [non intratur in veritatem nisi per caritatem]. It has been said, “Love does not consist in gazing at each other, but in looking outward together in the same direction.” Among Christians as well, loving one another means looking together in the same direction, in the direction of Christ. “He is our peace” (Eph 2:14). If we will turn to Christ and go forward together toward him, we Christians will draw closer to each other until we become what he prayed for: to be “one with him and with the Father” (see Jn 17:9). This can come about the same way that the spokes of a wheel fit together. The spokes begin at distant points of the circumference, but little by little as they get nearer the center, they get closer to each other until they form a single point. It happens something like what happened that day in Stockholm. See Hans-Georg Gadamer, Truth and Method (New York: Continuum International, 2006). Unitatis redintegratio, n. 1. All papal quotes are from the Vatican website. Raniero Cantalamessa, Due polmoni, un unico respiro: Oriente e Occidente di fronte ai grandi misteri della fede [Two Lungs, One Breath: East and West Before the Great Mysteries of Faith] (Rome: Libreria Editrice Vaticana, 2015). Joint Declaration on the Doctrine of Justification. This document can be found online on the Vatican website through its title. Jacques Monod, Chance and Necessity: An Essay on the Natural Philosophy of Modern Biology, trans. Austryn Wainhouse (New York: Knopf, 1971), pp. 170-171. See Jean-Paul Sartre, The Devil and the Good Lord, X, 4, trans. Kitty Black in “The Devil and the Good Lord” and Two Other Plays (New York: Random House, 1960), p. 141. See G. L. Prestige, God in Patristic Thought (Eugene, OR: Wipf and Stock, 2008), especially Chapter 13, “The Triumph of Formalism,” pp. 265-281. See Hans Urs von Balthasar, “Casta meretrix,” in Explorations in Theology, Vol II: Spouse of the Word, trans. John Saward (San Francisco: Ignatius Press, 1991), pp. 193-288. Augustine, The Answer to Faustus a Manichean, 32, 18, trans. Edmund Hill, Part 1, vol. 20, The Works of Saint Augustine, ed. John E. Rotelle (Hyde Park, NY: New City Press, 2007), p. 420. See Augustine, “Sermon 269,” 4, in Sermons (230-272B) on Liturgical Seasons, trans. Edmund Hill, The Works of Saint Augustine, Part 3, vol. 7, ed. John E. Rotelle (Hyde Park, NY: New City Press, 1994), p. 283. Antoine de Saint-Exupéry, Wind, Sand and Stars [Terre des hommes], trans. Lewis Galantière (1939; New York: Harcourt, 1967), p. 215.